Dorothy Ann White Kieffer, 88, of Salem, passed away Monday, October 29, 2018. She was born on July 5, 1930 in Staunton, VA, a daughter of the late Roy Lynn and Mary Virginia White. In addition to her parents, she was preceded in death by her husband, H. Cleon Kieffer, Jr., a daughter, Deborah Lynn Landes, and two brothers, Roy Lynn White, Jr. and Wade Hampton White. Dorothy was a graduate of Riverside Hospital School of Nursing, Newport News, VA and Norfolk General Hospital School of Anesthesia in Norfolk. 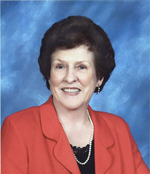 She retired from Lewis-Gale Medical Center as a nurse anesthetist practitioner in 1993. She was a member of St. Paul’s Episcopal Church in Salem. She is survived by her daughter and son-in-law, Diane and Bruce Butler; a granddaughter, Katelyn Butler and great-grandson, Matthew Deren, all of Charlottesville; also surviving are numerous nieces and nephews, and other extended family members. A Memorial Service will be held at 2PM, Saturday, November 3, 2018 at St. Paul’s Episcopal Church with the Very Rev. Robert E. Brodie officiating. In lieu of flowers, memorial contributions may be made to St. Paul’s Episcopal Church 42 E. Main St. Salem, VA 24153. An online guestbook is available for family and friends by visiting www.johnmoakey.com.